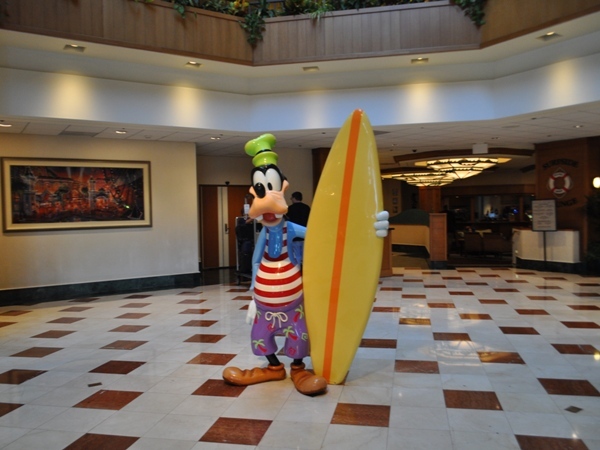 Back in March of last year, I spent one night at the Paradise Pier Hotel. It was the night before a 7-day cruise on the Disney Wonder and I don’t remember much about it. If you pressed me, I would have probably said it was like staying at the Hilton or Marriott. 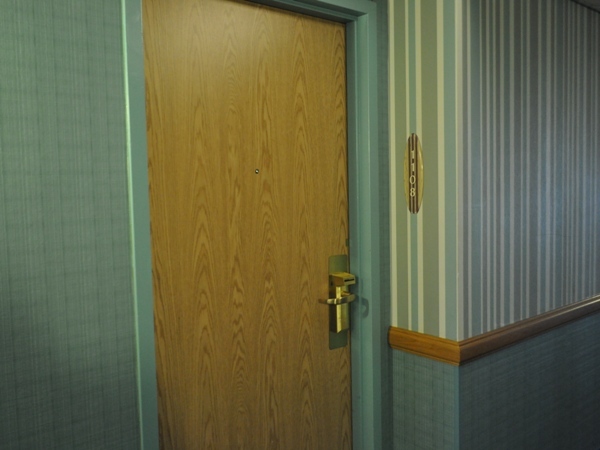 Either I was TOTALLY wrong or they’ve done some major redecorating in these rooms…I think both are probably the case. 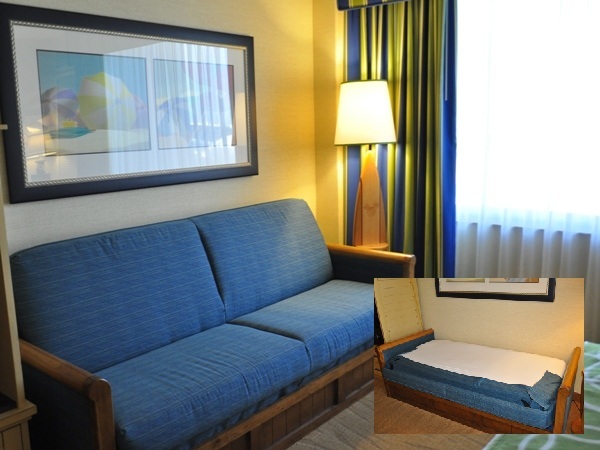 Bottom line….this is definitely a DISNEY hotel. Read on for more about my stay at the Paradise Pier Hotel or listen to my review on a recent episode of the DIS Unplugged: Disneyland Edition. 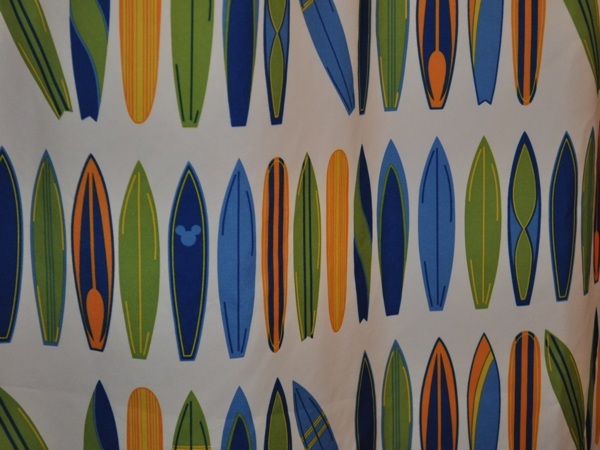 The theming starts before you even get into your room with a surfboard as your room number and beach colored walls. You might even find a few hidden Mickeys on the floor. The rooms are bright and colorful, with neutral colored walls and pops of color everywhere. Be careful though not to let one of those neat beach ball pillows bounce into your luggage (unless you think they’re worth the $65 the hotel would charge you). The room I stayed in had two comfortable queen size beds, plus a couch that made into a single bed [see inset below]. In the far corner of the room, is a small desk where you’ll find internet cables and WiFi information. The wicker chair isn’t all that comfortable, but the portable desk that slides out from beneath the desk makes a nice extra work space (and also makes working and watching World of Color at the same time much easier). 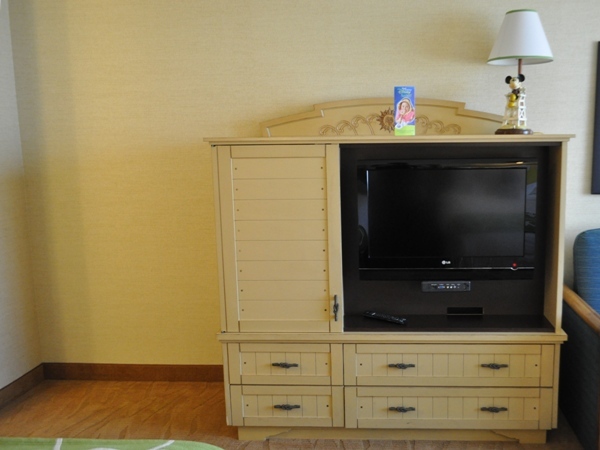 The entertainment center contains the television, fridge and safe, but only has four drawers for storage. Next to it is plenty of room for the luggage rack or luggage storage. …but, could be a bit small for a family of 4 or 5, with just a single sink. 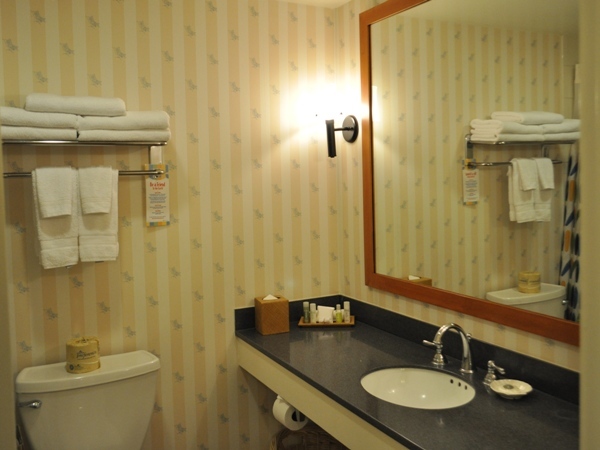 The rooms are very nice and if I were just reviewing the hotel rooms themselves, the Paradise Pier Hotel would get a much stronger recommendation, but to put it nicely….the public areas of the hotel are just “okay”. …to the non-descript gift shop. 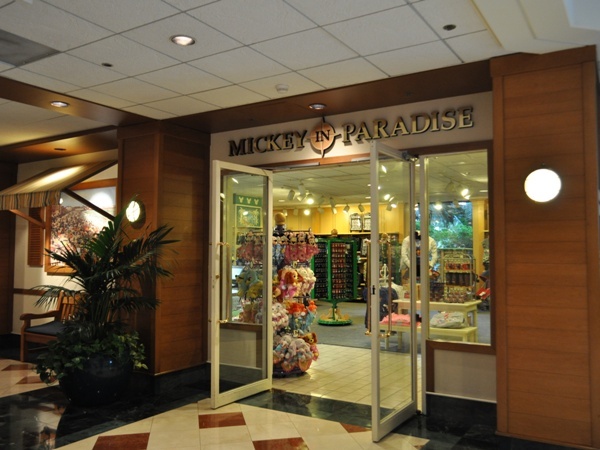 The biggest problem though lies in the restaurants of the Paradise Pier Hotel. The only casual dining is the Surfside Lounge [below], which doesn’t have a dinner menu and is really little more than a hotel bar. 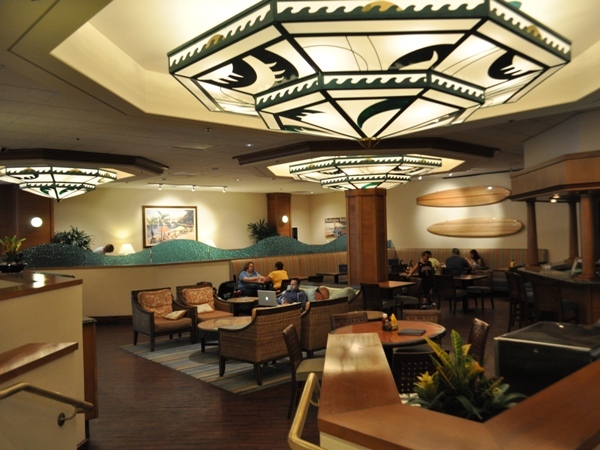 The other dining location is the PCH Grill, which hosts the Surf’s Up! Breakfast with Mickey and Friends in the mornings and serves a basic dinner of burgers, salads and pastas. There may be good news on the horizon, however, when it comes to the PCH Grill, as the Disneyland Resort has just announced a new, more upscale menu that should debut this fall. I really don’t think it would take much of an investment to bring this hotel closer to the level of the Disneyland Hotel…of course, if that happens, guests will be paying rates closer to the level of the Disneyland Hotel and the “more affordable” option would be gone. 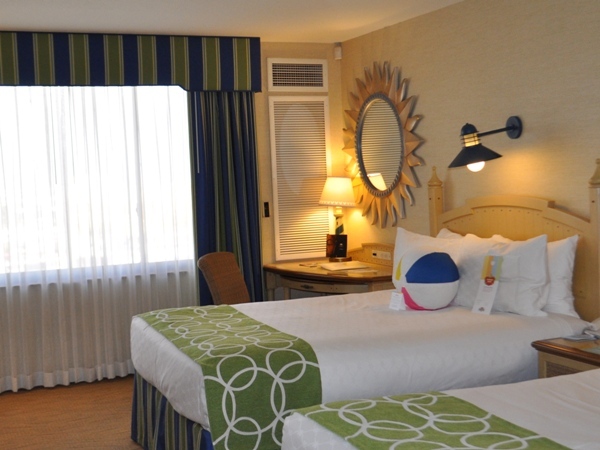 As it is, the Paradise Pier Hotel is a great option for guests that want to stay on-property and enjoy all of the Resort Hotel guest benefits, while still saving a little money. 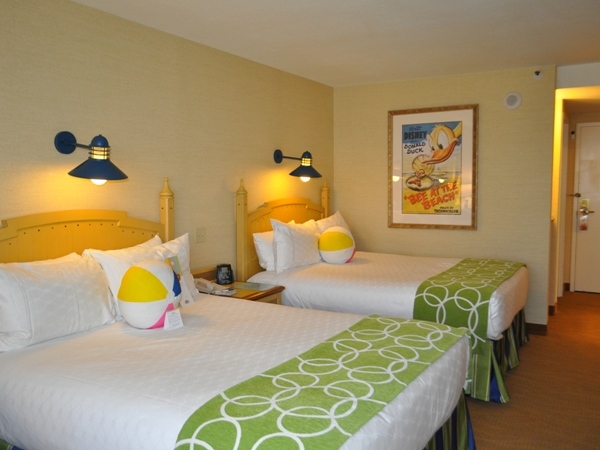 The rooms are comfortable and there’s easy access to the Parks, Downtown Disney and the rest of the Disneyland Resort. 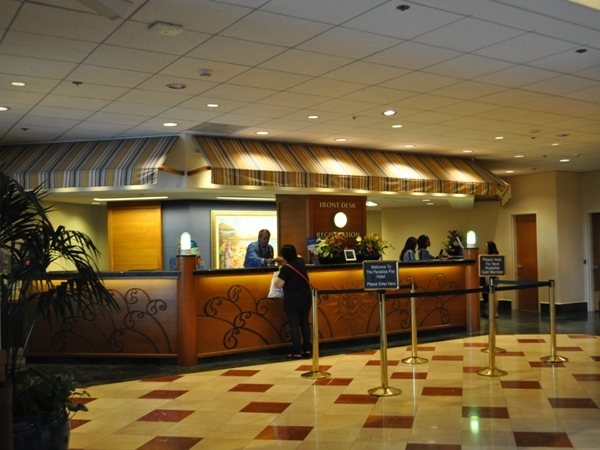 Don’t overlook it when you’re choosing a hotel for your next Disneyland vacation.